"Everyone was thrilled to have been able to attend and will be taking what they have learned and applying it back at their workplaces. The overwhelming comment was that now they understand why the different generations respond differently to the same situation. Some even said that now they may understand their kids better. It was a great presentation, informative and educational. This should be something presented in every workplace." "Olivia's knowledge, understanding and experience in corporate training has been invaluable in the success of several projects in a wide variety of industries. She helped us to understand and fill "knowledge gaps" in our development and delivery of health and safety training materials so that supervisors and employers are better equipped to train their workers." "Wonderful keynote, very informational and well presented"
Take the Kindness Engagement Survey. Click on the the icon above and go direct. Orders 10 or more receive a 20% discount! 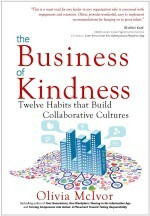 The Business of Kindness ….